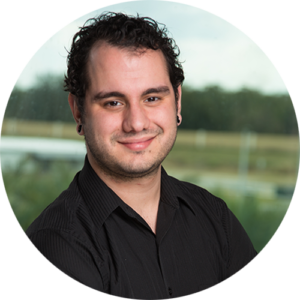 As IT Support at BRIDG, Michael Scotto is responsible for troubleshooting network and workstation-related issues while maintaining shared technology across the office, fab, and labs areas. He also ensures protocols and implementation for security and compliance within network policy and provides insight and guidance related to general IT practices. Prior to BRIDG, Scotto worked at Epos Now in downtown Orlando, where his primary role was to implement Point of Sale systems from small to midsize businesses, both domestically and internationally. During his time with the company, Scotto implemented over 150 businesses onto Epos Now’s Point of Sale platform, achieved Top Sales in Support for 9 months, received awards for Top Support Performer two years in a row, and operated the Tier II, dispatch, repairs, and complaints departments. Before Epos Now, Scotto was an independent contractor working at chain restaurant and retail stores. Scotto has lived in Florida for 12 years, mostly in the Central Florida area. He recently graduated from the University of Central Florida with a Bachelor of Science degree in Information Technology, where he focused his studies on network administration, cyber security, programming and scripting, and computer maintenance and troubleshooting.